Charlie McAvoy and Clayton Keller didn’t wait long to score their first NHL goals as each began his first full pro season. 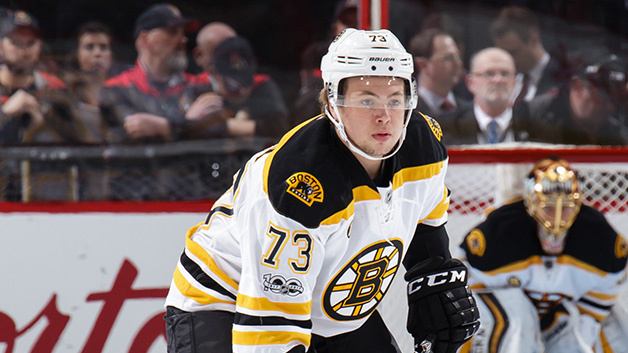 McAvoy scored a goal and added an assist as the Bruins edged Nashville, 4-3. Keller’s goal gave Arizona an early 2-0 lead against Anaheim, although the Ducks would rally for a 5-4 win. As the NHL season begins, there are 14 Terriers—and 70 Hockey East alums—on NHL rosters. Three teams have two BU players: Arizona, Adam Clendening and Keller; Boston, Matt Grzelcyk and McAvoy; and Buffalo, Jack Eichel and Evan Rodrigues. The Avalanche have three: A.J. Greer, Matt Nieto and Colin Wilson. Rodrigues and Greer are on injured reserve. The other Terriers: Nick Bonino (Nashville), Charlie Coyle (Minnesota) Eric Gryba (Edmonton), Wade Megan (St. Louis) and Kevin Shattenkirk (NY Rangers). Several put their names on the score sheet in their opening games. NCAA Ice Hockey featured BU on its twitter account as the season begins. ►Sophomore Jake Oettinger is one of five Hockey East netminders on the 20-man watch list for the Mike Richter Award presented to the top NCAA Division 1 goalie. As a freshman, Oettinger had a 2.11 GAA and .927 save percentage, earning Hockey East All-Rookie Team and Second Team All-Star recognition. As he begins his first full season on the Bruins’ blueline, McAvoy’s name is all over hockey experts’ lists of top candidates for the Calder Trophy as top NHL rookie. The Hockey Writers examines what it will take to earn that honor. Despite a strong training camp with the Sharks, Danny O’Regan starts the season with the AHL Barracuda with whom he led the league in rookie scoring a year ago. But a promotion to the big club seems inevitable. ● SanJoseInside.com: Danny O’Regan Leads Barracuda. But for How Long? 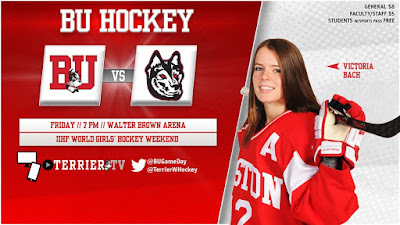 Terriers begin a home-and-home series with #8 Northeastern tonight at Walter Brown Arena with puck drop set for 7 p.m.